This morning the Mortgage Bankers’ Association (MBA) reported mortgage application volumes for the week ending April 12th this morning. Refinancing volumes dropped over 8% after an 11.4% WoW drop last week. Refinancing is still running at a strong pace (roughly twice the pace where they finished last year), but the more economically relevant result was the strong purchase application data. 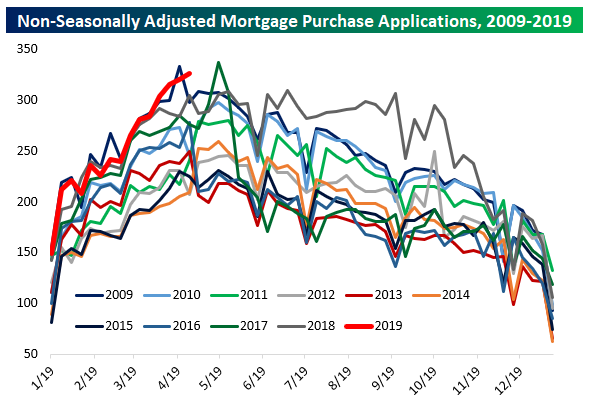 Applications for purchase are a leading indicator of home sales, so the new cycle high in purchase application volumes posted this week is a good sign that the housing market remains in a much better position than where it stood last year. Weekly data can be tricky to seasonally adjust, so it’s also worth taking a peek at weekly data without seasonal adjustments. 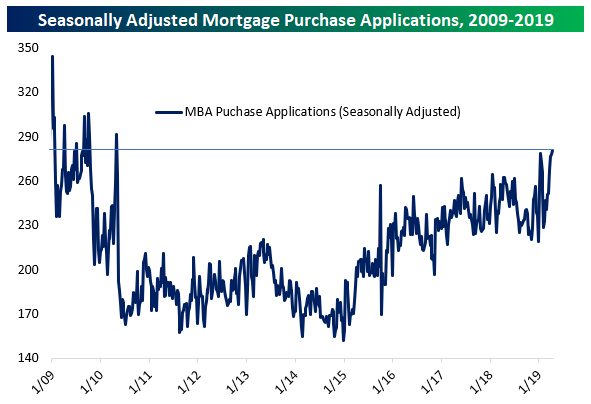 As shown, we’re right near the typical seasonal peak for application volumes, and as-of this week, only two weeks since 2009 have recorded stronger purchase application volumes. That confirms the basic message of the seasonally adjusted index, which is that mortgage applications are running at a very strong pace. On a YoY basis, purchase application volumes are not extremely strong, but it’s pretty clear there’s a healthier trend than the period in the second half of last year. Since week-to-week applications can be pretty volatile, it helps to smooth things out with a rolling 4-week average. 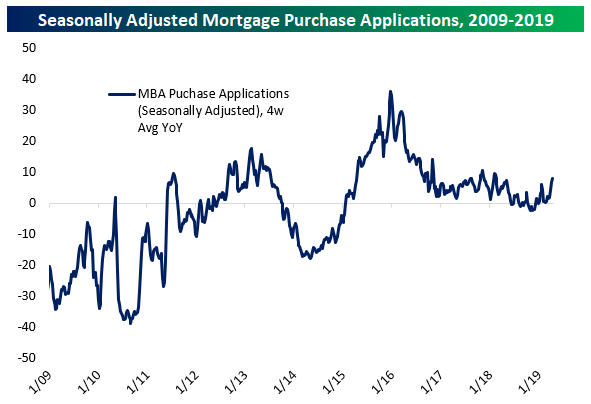 Using this approach, the 4-week average of purchase applications is up 8.2% YoY, the best pace since the week ended February 9th of last year. Start a two-week free trial to Bespoke Institutional to unlock the full Bespoke interactive research portal.